Captain Drew to Take Over GARF!! Posted by Captain Drew in Captain's Log, Press Conference. Comments Off on Captain Drew to Take Over GARF!! They’re playing Coldplay over the loudspeaker system… large crowd of people… everyone seems to be in a good mood!! The chatty/happy people were leaving work for the day. We’re the only ones here now. We’ve been ushered into another room by one of the Captain’s crew. The press conference has started. The Captain is explaining his overall strategy to the large group (three) of assembled reporters (janitors) gathered around his podium (toilet stall). The plan, as we understand it, is three-pronged. Prong One of the plan, called “Video Prong”, involves the installation of a classic video arcade called “Captain Drew’s Poopdeck of Adventure” which will feature games which generally fit the theme of a Renaissance Faire. An early list of these games has been quietly distributed to the largely spanish-speaking crowd of reporters (from underneath the wall of the Captain’s stall). We’ve managed to get a copy of that handwritten list… as the guy in front of us called it “basura” and put it into a waste receptacle. 6. Anything with that Burgertime guy in it. 9. That game with a wizard guy drawn on the side of the box. You know the one. Prong Two of the plan will be called “Sneaky Time”… it’s to be a ‘whisper campaign’. The Captain is suggesting acceptable responses to this propaganda-esque set-up line…. At a predetermined time of the Captain’s choosing (4 o’clock), his crew will methodically begin blocking each and every one of the festival’s portable toilets with a largely indigestible chunk of Ye Olde Friede Cheese Logge from the food court. The Captain has interrupted his own press conference to request that an assistant help him remember never to eat another chunk of an Ye Olde Friede Cheese Logge. Press conference resumed. 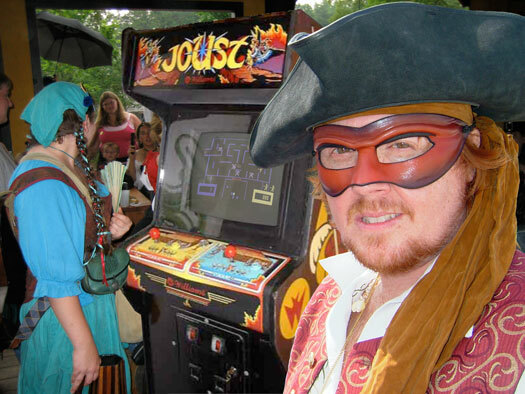 While blocking the toilets, the Captain’s men will simultaneously distribute broadsides which direct patrons to “Captain Drew’s Poopdeck of Adventure” where it will be revealed that the classic video game cabinets also contain chemical toilets, which may be used for $5 “a game”. The press conference has just started breaking up, they’re playing Coldplay and the Captain has emerged and is refusing to answer questions from the assembled reporters, who are already spraying him with cleaning products. More on this story as is warranted (which, let’s face it, isn’t very likely).